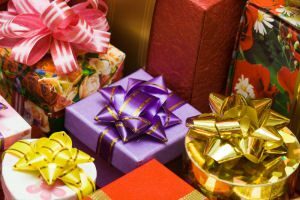 During Advent and Christmas seasons share the joy of gifts. Did you receive nice new gifts, especially new clothes or new toys, which you won’t use? Donate them! Since December 2009 this Re-Gift Box has annually collected 400 – 500 gift items. We are especially grateful for the clothing and housewares, new toys, games and dolls. Your gifts are redistributed to those in need by Foundations Preschool of Ann Arbor; the Project OutReach Team “PORT” for persons who are homeless with a mental illness; as well as, St. Louis Center in Chelsea, for children and adults with developmental disabilities. A special thanks to Mary Hayden & Sharon Harrington both who has served as our volunteer coordinator. For more information contact Scott Wright, Director of Parish Outreach Ministry Office, at swright@stfrancisa2.org or 734-821-2121. Take a gift tag off the tree and follow the gift description directions. Purchase a gift described, wrap it if you like, and securely fasten the tag to your package. Please box all gift certificates. Return your gift to the Giving Tree as soon as you can, but no later than the third Sunday of Advent. If your gift is late please bring it to the Parish Office. Become one of the many helpers who makes this amazing program possible. Please see our Giving Tree Volunteer Sign-Up. Thank you to Corrigan Moving of Ann Arbor for their generous donation of the storage containers “Corrigan Cube“ where we house all the gifts until they are distributed. Benefiting organizations in various years have been: Alpha House Family Shelter; ArborVitae Women’s Center; Angel Tree by Diocese of Lansing; Mexiquenses en Michigan; Catholic Social Services (Various Programs); Community Action Network; Community Support and Health Services; HIV Health and Beyond; Home of New Vision; Hope Clinic, Inc.; Ozone House; Foundations Preschool of Ann Arbor; Project Transition; St. Francis Parish St. Vincent Service Ministry; St. Louis Center, Chelsea; & SOS Homeless Children’s Services. For more information contact Scott Wright, Director of Parish Outreach Ministry Office, at swright@stfrancisa2.org or 734-821-2121.